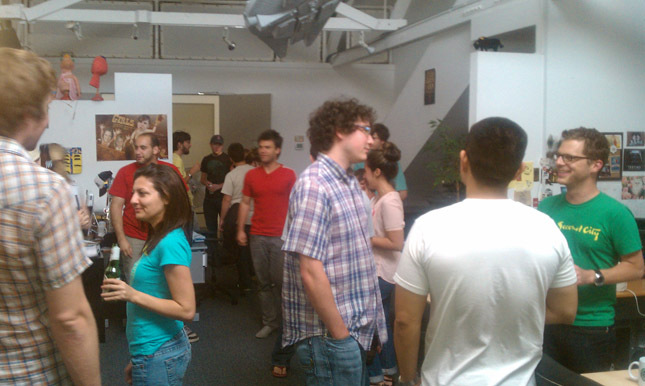 We just had another web start-up join us in the building, so we invited them over to our studio for a beer. The group, MOVIECLIPS.com is dedicated to categorizing every single awesome movie moment into one searchable site. Pretty worthwhile pursuit, eh? You can check them out at their website, where their collection grows bigger by the week! This entry was written by paulhanges and posted on July 16, 2010 at 6:28 pm and filed under Friends. Bookmark the permalink. Follow any comments here with the RSS feed for this post. Trackbacks are closed, but you can post a comment. Your staff and offices rock. Thanks for having us over and making everyone feel welcomed.